[AUTO](VC/RC):[Counter Blast (1)-card with "PR♥ISM" in its card name] When this unit's attack hits a vanguard, you may pay the cost. If you do, choose one of your other rear-guards, and return it to hand. 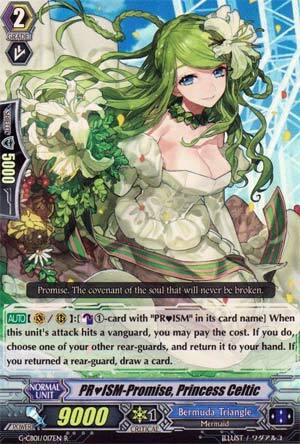 If you returned a rear-guard, draw a card. Oh thank Daigo people don't have to run vanilla PR ISMs anymore. Replacing Lumiere and Ligurian, this card, upon hitting the Vanguard, counterblasts a PR ISM to bounce a rear-guard you have to the hand, then draws a card if you do bounce. Yay Early Game pressure. Still doesn't convince me to use the deck itself because it's not really that good, but the ability to gain new cards for cheap is okay I guess. She's not bad. Just a bit bland to talk about. Also, unless you're really good at column forming early somehow don't expect her to hit too often. Celtic's a simple skill, Especial CB1, bounce a unit, draw a card. Nice and simple. ...Doesn't make PR♥ISM Bermudas really good, seriously, Bushi, you should have given them more support before. Ratings are for the PR♥ISM deck only.